Autism and the Art of Communication: It's not rocket science - please, try this at home! It's not rocket science - please, try this at home! "I ... have a 15 year old son on the spectrum - verbal, but with significant academic delays ... I had to share this story with you. Your approach of using drawing rang a bell with me, because Jake has always been very visual. As I mentioned to you, though, he does not enjoy drawing (or any type of art for that matter), and does it only under duress. You suggested that I draw for him, which was an idea I liked a lot. Anyhow, I came to the conference looking for ways to move forward on making plans for Jake's future as an adult on the spectrum - his delays present some big challenges. A second challenge has been his lack of participation in that planning. When I've asked "hey Jake, what do you want to be when you grow up?" - usually in the context of also asking his four siblings, his response has consistently been "Pfft. Iiiiiii dunno", or something similar. This morning, he and I sat down with a sheet of paper and a pen. He was immediately intrigued. I drew a series of boxes - like a cartoon. 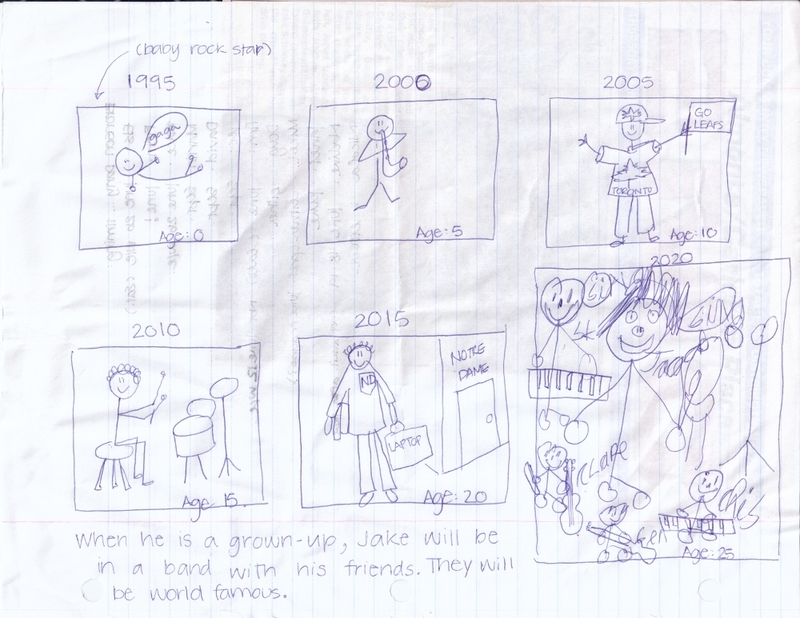 The first was labelled "1995, Age: 0", and showed a stick-baby with a speech bubble saying "gaga". Then "2000, Age: 5" - a little stick kid playing a plastic saxophone (favourite toy at that point). "2005, Age: 10" - slightly bigger stick kid in the Toronto Maple Leafs shirt and hat that he used to wear to drive us all CRAZY at that age. "2010, Age: 15" - stick teenager playing the drums (he takes drum lessons now). I continued: "2015, Age: 20" - he'll still be in school, so I drew a bigger stick-guy with his high school uniform sweater, holding some books and his laptop. Finally, I got to the last box. I labelled it: "2020, Age 25", and handed him the pen. HE BLEW ME AWAY!!! He drew this really detailed picture of himself playing in a band with four of his friends. The two lead singers ("just like Blue Rodeo") got speech bubbles saying "sing", and everyone was playing an instrument and labelled by name. The style was as rudimentary as mine had been (and in keeping with how he would normally draw), but the detail was like nothing I'd ever seen. When he finished, he put down the pen, looked at me, and said "That's my dream. I want to be in a band with my friends. And not just a FUN band - a WORLD FAMOUS band!" Then we talked about how that might happen. What you'd need to learn, for example ... what that trajectory might look like. He has a dream!!! He's obviously had it in there for quite some time, and now, thanks to you, it's out, and we can talk about it and work towards it! My husband and I are already brainstorming about how else we can use this technique with him. So, you know - THANK YOU!!! You can't imagine what this means to us." "... about a month ago now, Jake played drums at a show that his music school put on at the ... arena. He was nervous about getting up on stage in front of his peers, but he overcame his anxiety. He blew the place away, and made the front page of our local newspaper as a result! (Not sure if you can tell in his drawing, but he's the drummer - the drum kit is to the right, and he's holding a drumstick.)" So in contrast to the usual rider you might see on a television program ("do not attempt this at home"), I would say instead: "Please, try this at home. See what happens." Then do feel free to contact me and let me know how it went (what worked, what didn't) and I'll do my best to suggest some useful "next steps".